Use Meat Magic® on broiled, roasted, grilled, barbecued, stir-fried, bronzed or blackened beef, pork, poultry, veal, fish and wild game. Easy to use in bean dishes, chili, stews, gravies, gumbos and soups. Substitute for normal use of salt, pepper and other herbs & spices called for in a recipe. 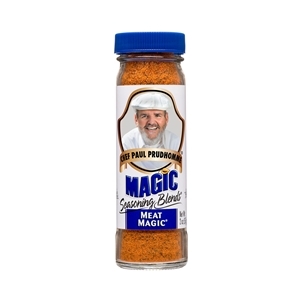 Magic Seasonings are versatile in their application and pack incredible depth of flavor. Contains no MSG or preservatives and is Kosher approved. Ingredient: Salt, spices, garlic, paprika, onion, tri-calcium phosphate (anti-caking agent).